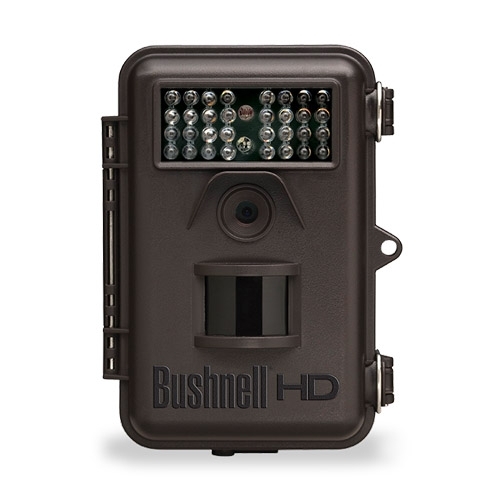 At 6" tall and 4" wide the Bushnell Trophy Cam 8MP with Video is small enough to fit in your palm, and packed with technology that will put your hands around antlers like no other trail camera on the market. Along with efficiency of space the battery life and trigger speed are among the best in the industry. They'll run up to 12 months on a single set of 8 AA batteries. The camera has a trigger time of consistently less than one second and will record either high-quality still images or high definition video. The Trophy Cam also won't alert game animals, thanks to 32 night-vision LEDs. Select up to three rapid-fire images per trigger, or a 0- to 60-second video. GPS geotagging ensures you know exactly where your images came from while temperature and moon-phase stamps help you pattern your trophy buck.